When Daniel Sempere visits the Cemetery of Forgotten Books, his father invites the boy to take his pick from the shelves. Daniel settles on The Shadow of the Wind by Julian Carax; a Barcelona writer exiled in Paris. Carax’s work has become much sought after due to its rarity. Even the devil wants a copy. The novel, The Shadow of the Wind by Carlos Ruis Zafón, first published in 2001, bears the same name. It portrays the Catalan capital in an unconventional light, or rather, darkness. Zafón’s Barcelona is often enveloped in fog, drenched in rain or even covered in a carpet of snow. This tells us more about the psyche and influences of the author than his native city. In Zafón’s library, I would expect to find works by Stevenson, Conan Doyle and Zola. Sadly, there is no Cemetery of Forgotten Books in Barcelona. Nevertheless, you can pay your respects to the run down Arco del Teatro where the fictional bookstore is situated. The street is near Las Drassanes, the Barcelona shipyards that first came to note in the 14th century when the kings of Aragon and Catalonia began to use the city as a port. At that time, the Aragonese dominated much of eastern Spain and southern Italy, as well as a number of Mediterranean islands. In truth, Arco del Teatro has not changed much. It is not a street where you are likely to want to spend much time. However, the Raval has its charms with a multicultural population and a vibrant nightlife. In recent years, it has spawned groups of mestizo (mixed race) musicians, such as the wonderful Ojos de brujo. On Sundays, crowds flock into the nearby Sant Antoni Market in search of second-hand books. Fans of the novel may recall Fortuny and Sons; a hat makers’ shop owned by the father of Julian Carax, situated on Ronda de Sant Antoni. Today this Raval thoroughfare is the centre of the city’s red light district. Hookers continue to ply their trade in spite of a clampdown by the Ajuntament (City Council), which can result in hefty fines for both prostitutes and their clients. Daniel and his father lived in Santa Ana, between the Ramblas and Portal de l’Àngel. Just off this street is Placeta de Ramon Amadeu, a peaceful little square that provides respite from the hustle and bustle. There you can see the Santa Ana church where a wedding takes place at the end of the novel. Continuing the stroll down to Portal de l’Àngel, you will find Quatre Gats on Carrer Montsió – an alley, opposite the Paris Cinemas. In the novel, this Bohemian establishment is the place where Daniel’s parents first set eyes on each other. It also provided the venue for Gustavo Barceló’s literary meetings. I found the café awash with paintings, drawings, photographs, ceramic plates and chandeliers that recreate the modernista atmosphere of early twentieth century Barcelona. It all began when a young architect called Josep Puig i Cadafalch was assigned to design a building on a space formerly occupied by Dominican nuns. The result was a Neo-Gothic edifice, more Flemish than Catalan in style. Movers and shakers in Barcelona society sometimes rented rooms there. Pere Romeu, an art lover, saw a business opportunity on his return from Paris. His vision was to establish an artistic café like the Chat Noir in Montmartre. Romeu lacked the cash to back up his ideas but thanks to his friend Miquel Utrillo, they got the support of renowned and wealthy artists. Ramon Casas and Santiago Rusiñol helped get the project up and running. Were these gentlemen the ‘four cats’? Possibly, but bear in mind that this expression is the Catalan equivalent of the English ‘Four Men and a Dog’. Detractors of the project were said to have claimed the café’s clientele would consist of this. They could not have been more wrong. Instead, 4 Gats, which opened for business in the summer of 1897, became a hub of Barcelona’s artistic activity around the turn of the century. High calibre names like Gaudí, Pablo Picasso were often present, as was the Nicaraguan poet Ruben Dario, one of the heavyweights of modernist Hispanic poetry, who liked to go there when visiting the city. For those who prefer outdoor café society, the Plaça Real is one of the main meeting points. 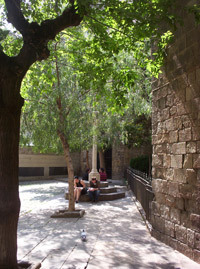 It was near here that Daniel first encountered the beggar-spy Fermin Torres underneath the arches connecting Passatge de Madoz with Carrer Ferran. The Barceló family in the novel lived around there. Amid the bustle of outdoor café life, I could detect the sounds of a distant piano. Perhaps it was Daniel’s childhood sweetheart Clara Barceló going through her musical routines. I continued my trip down to the foot of the Ramblas and the Columbus Monument. It was built in 1881, following an architectural competition anticipating the 400th anniversary of the explorer’s arrival in America. Daniel sat watching the pleasure boats, like those that still set off for the Balearics and other Mediterranean destinations. Lain Coubert confronted him in this area. Fortunately, on this occasion, the fiend with the charred face was not loitering with the intention of burning my copy of The Shadow of the Wind. From there, I took the Montjuïc funicular train from the Parallel Metro. Those with a head for heights can then take a cable car to the top. I preferred to climb and dwell on the possibilities of the origin of the Montjuïc toponym. Some claim that it derives from Mount Jupiter. However, it is more widely believed to stem from the Catalan for Jewish Mountain. Documentation shows that a Jewish cemetery once existed in the area now covered by the vast south-west cemetery. It is believed to hold over one million corpses including victims of horrendous yellow fever and cholera outbreaks which occurred periodically in the city throughout the 19th century. Disease was one of the reasons that led to the demolishment of the city walls in the 1850’s, resulting in the development of the modern city or Eixample. Barcelona’s history museum contains chariot wheels, ceramics and tombstones unearthed on the hillside, which testify to Montjuïc being populated since Roman times. Evidence of a castle somewhere on Montjuïc dates back to the early 11th century, although it is debatable whether the present structure is on the original site. A provisional fort was built and was used in the Battle of Montjuïc during the mid-seventeenth century Reapers’ War when Catalan peasants rose against the forces of Philip IV of Spain. It was transformed into a more permanent structure that fell briefly into the hands of the Habsburgs in 1705 during the War of the Spanish Succession. The castle was further strengthened by Spain’s early Bourbon monarchs. Amenities like drinking water and cisterns were soon added, along with extensive barracks, artillery, and kitchens able to feed up to 3,000 people. sted for over eighty days. Many of Barcelona’s wealthier citizens were happy enough, given that they were safely tucked up in Grácia, a separate village at the time. When it all ended, progressive elements of society were severely dealt with and public executions took place on the Ramblas. By the end of 1843, Barcelona had finally submitted to centralized control from Madrid. Prim meanwhile, was awarded the title of General for his ‘pacification’ of the city. However, The Shadow of the Wind is set during the Franco era. Zafón weaves elements of Barcelona’s history into his fiction. In this novel, the sinister Inspector Fumero, who brings to mind some of Franco’s henchmen, commits atrocities in Montjuïc Castle. In reality, the castle has witnessed many grim events over the years. The most famous victim of the purges at Montjuïc was arguably Lluis Companys, the Catalan president of the Second Republic. The mausoleum to Companys is a simple structure in the Fossar de la Pedrera section of the cemetery where many of the executed were taken during and after the Spanish Civil War. It is also the resting place of many notable names including the anarchist leader Buenaventura Durruti (his Column might ring a bell), Father Jacint Verdaguer (one of Catalonia’ most highly regarded poets), as well as artists like Santiago Rusiñol and Joan Miró. Fictional inhabitants include the mother of Daniel Sempere and others with connections to the Cemetery of Forgotten Books. The Olympic Stadium at Montjuïc is known as the Lluis Companys. It may not be the Camp Nou, but it still has a 55,000 capacity and is home to FC Barcelona’s soccer rivals, Espanyol. Although it is rarely packed to the rafters, it is worth taking in a match there if Barça are playing away and another big name like Real Madrid or Valencia are in town. Travelling through this area, I was struck by just how much Zafón’s love affair with Gothic fiction has led to a mythical and romanticised portrayal of his native city. Times have changed of course, but there was no sign of the gloom described in the novel. In fact, many of the mansions are of the fairytale rather than the sombre variety. Tibidabo Avenue is not only uphill but also upmarket, with fairytale mansions resplendent with minarets and nou-centisme designs. I passed the address of the Angel of the Mist, the gothic mansion at no.32 Avenida de Tibidabo, which contained the tomb of the childhood sweetheart of the fictional Julian Carax. It is there that Carax comes face to face with the sinister Inspector Fumero. This showdown is not so much a case of Jekyll versus Hyde, but rather the latter confronting his twin brother. On top of the mountain is a funfair. Rides include the Pèndol (pendulum), which drops its passengers 50 metres at a speed of 100 kph. Daredevils are best advised to leave eating to afterwards. I stopped off at the Mirablau café. Its large glass windows offer open views over the city below. A light mist floated over the city. If only it had been a bit thicker, it would have been just Zafón’s type of day. The twist in the plot could well be that the sun will come out during your visit. Zafón returns to the world of the Cemetery of Forgotten books in his new novel, El juego del ángel (The Angel’s Game). English-speaking enthusiasts will have to wait until the summer of 2009 for the translation.